For a complimentary consultation and financial advise on precious metals and diamond investments, please contact us at 858-571-4560 or follow our Appointment link. Rock N Gold Creations services the Greater San Diego area. Knowing how to buy gold, silver & platinum coins and bullion and investment diamonds can provide you with diversification in your investment portfolio and build a nice collection to enjoy. There are many different ways to own gold, silver & platinum and investment diamonds and it can get quite confusing. When most people think of gold, silver & platinum, they think of large bars stored in vaults deep below the surface of the earth. 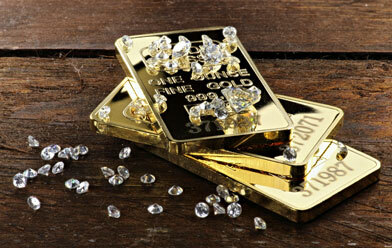 In fact, gold, silver & platinum bars come in many different shapes and sizes to meet the needs of different investors. Gold, silver and platinum bullion bars are sold by the troy ounce and sold for a percentage over the spot price. Investors should distinguish between bullion coins whose values generally fluctuate according to the current price of gold, silver or platinum, and "rare coins" that can carry a significant collector premium based on historical supply and demand. Some U.S. gold, silver and platinum coins may be readily available in circulated condition for a modest premium over their bullion content, but those same coins in superb condition may have significantly higher value. Large diamonds, clear diamonds, and flawless diamonds are rare, and diamonds that combine large size with clarity and lack of flaws are rarer yet. These diamonds fall within the classification of investment-grade gems for their rarity and beauty. When compared with standard diamonds, investment-grade diamonds have greater rarity and greater purchase prices but also see greater increases in value, also called appreciation, over time. The ideal quality of diamonds’ four C’s, cut, clarity, color, and carat, vary between white diamonds and color diamonds, but investment-grade gems will lean toward the higher, rarer end of each characteristic.